In the last eight months, while CPI (retail inflation) has consistently moved upwards, the WPI (headline inflation) has dramatically contracted. The composition of the two indices is such that while food has a higher weightage in CPI, manufacturing has a higher weightage in WPI. The two main inflation indicators — the Wholesale Price Index (WPI) and the Consumer Price Index (CPI) — are moving in widely divergent directions. In the last eight months, while CPI (retail inflation) has consistently moved upwards, the WPI (headline inflation) has dramatically contracted, leaving a substantial 7.8 percentage point gap between these two inflation estimates. The development has posed a problem for policy makers as while the movement of consumer prices makes out a case for higher interest rates, the wholesale price movement demands urgent reduction in key interest rate. While some amount of differences can be explained by the variation in base years, basket of items and weights allocated to the individual items in the two indices, economists say that the divergence between the two currently is massive and “ideally CPI should not be more than one percentage point of WPI on either side”. 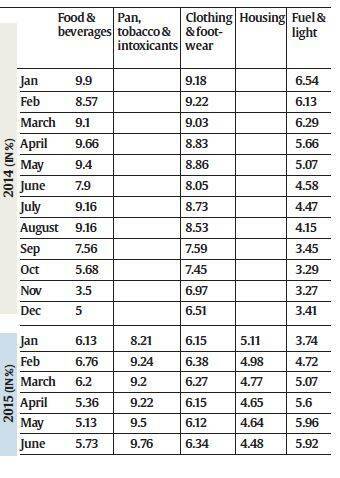 Headline inflation in June was -2.4 per cent while the retail inflation was 5.4 per cent during the month. This has brought the focus back on the lack of a competitive integrated market in the country, one of the main reasons for the CPI to remain high. “If we had a really competitive integrated market, price changes at the upstream level, i.e., the raw material, intermediate goods and capital goods, should get reflected in the final products and eventually in the CPI. However, the market is not integrated and the changes are not getting reflected, therefore CPI remains high,” Pronab Sen, chairman of National Statistical Commission, told The Indian Express. Sen said that while the prices of raw materials have gone down considerably, it is not showing in the final price of the product. “Since the CPI measures the final consumption, it still remains high. Ideally both the WPI and CPI should not be more than one percentage point of WPI on either side,” he said. On the other hand, the headline inflation has been declining due to the significant fall in the global commodity prices, leading to a decline in the prices of raw materials. The fact that WPI maps the entire production chain and measures inflation across the spectrum has been reflected in its movement in the past few months. The headline inflation has been heading south since June 2014 when it stood at 5.66 per cent, subsequently falling to 1.66 per cent in October, turning zero in November and then entering into the negative zone in January 2015 when it stood at -0.95 per cent. 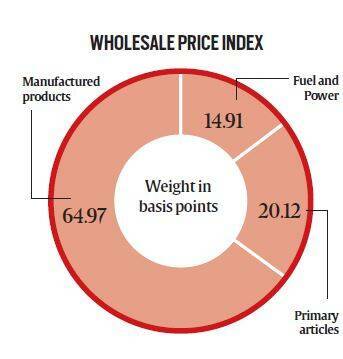 The composition of the two indices is such that while food has a higher weightage in CPI, manufacturing has a higher weightage in WPI. The fall in global food prices has definitely helped in bringing down both the retail and wholesale prices, but certainly WPI more than CPI. “Fuel prices have climbed down sharply. However, the government has not passed the benefit of a benign fuel prices to customers. That has been used to reduce subsidies and strengthen the fiscal position. This can be seen in CPI,” Madan Sabnavis, chief economist, CARE Ratings, said. The basket of items for the two indices is also different with cost of transportation and rent on housing being a part of the CPI and not WPI. What also needs to be kept in mind is the fact that while WPI is measured on base year 2004-05, CPI is measured on base year 2012 instead of 2010. The government moved to the new base year for CPI from January 2015. Sen said that lower raw material prices are not getting reflected in final goods because users are not passing it to consumers. “They are getting higher margins with fuel being the prominent example. Margin is profit per unit of sale. Volume of growth is not much but value-added growth is high and this is what captures the high profit margin,” he said. However, both Bhattacharya and Sabnavis concede that while profit margins are a significant factor in the CPI divergence, corporate profits have not really gone up much so as to define the current gap between the two indices. So, given the fact that India lacks infrastructure and does not have an integrated market, is CPI the right index to target by the RBI? 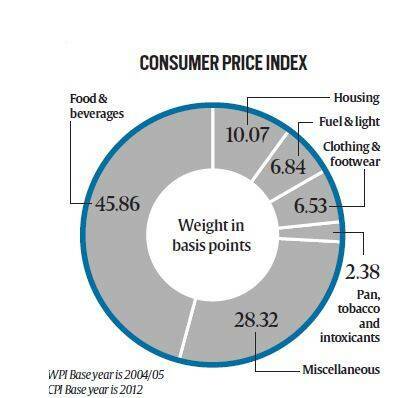 “CPI is a measure of cost of living … However, whether it should be used by the RBI is a matter of debate. I believe that one should look at WPI because our markets are not integrated. In economies where such markets exist, CPI is the ideal measure. In such markets, both CPI and WPI should move in tandem,” Sen said. However, Sabnavis said that while WPI may be a more effective measure of inflation, CPI has to be the target of the RBI because “the central bank has to maintain the real interest rate and therefore has to target CPI because retail consumers are impacted by it”. Early this year, the finance ministry and the central bank signed an agreement for the monetary policy framework where it was agreed to target CPI for monetary policy purpose. Negative WPI a cause of concern? Not until the manufacturing sector turns negative, says Sen. He adds that while the growth in the core sector and index of industrial production is moderate, it is still positive. Sabnavis said that since the GDP is growing and the job creation has not been impacted so far so the contracting WPI is not a concern for the economic growth “though it will have an impact on corporates”. Going forward, the economists say that WPI, the producers index, will be at similar level this year and improve next year due to base effect, CPI, the consumers index, will be between 5-5.5 per cent and the divergence will come down.